Book Review: Pygmalion by George Bernard Shaw - fairy skeletons. 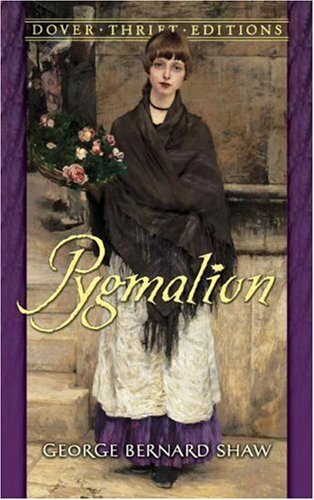 Pygmalion is a 1912 play by George Bernard Shaw. In ancient Greek mythology, Pygmalion was the creator of a statue which came to life and was a popular subject for Victorian era English playwrights, including one of Shaw's influences, W. S. Gilbert, who wrote a successful play based on the story in 1871, called Pygmalion and Galatea. Shaw also would have been familiar with the burlesque version, Galatea, or Pygmalion Reversed. Shaw's play has been adapted numerous times, most notably as the musical My Fair Lady and the film of that name. This was... well, interesting. I'd never heard of it before, and I'd never read a play other than Shakespeare. Needless to say, it was considerably quicker to read, and slightly confusing. The title is a reference to the Greek myth of Pygmalion, a sculptor who created a statue of a woman and promptly fell in love with it. With the help of Aphrodite, she came to life. (You can read the myth here.) The themes of the book are sort of parallel; a phonetician with a Holmes-like talent for knowing where people were raised by their accents who taught a poor flower girl to speak like a duchess treated her as his "creation" and not as an individual. Although the two clashed too much to fall in love, the flower girl eventually did rise somewhat in social class and remained the phonetician's friend. Henry Higgins was the "Pygmalion" in this play. He practiced the obscure profession of phonetics, and taught the wealthy to speak well for a living. Because of this, he was a bit of a snob. Higgins was also extremely moody and condescending. This was part of the reason why he treated Eliza (the flower girl) so unfairly, although in his eyes he "never gave her the slightest provocation". In my opinion, Pygmalion was basically the story of one very messed-up guy and his mistreatment and ultimate resolution with someone who at first appeared less powerful than he was. Various other important females in Higgins's life, like his housekeeper and his mother, entreated him to be more reasonable towards Eliza, but he seemed to be unwilling to accept any female advice. He only caved a little when spoken to by a man. Higgins had very strange ideals and outbursts throughout the play. Most modern people would roll their eyes and think, "Anger management problems~" very early on while reading. However, it's a pretty quick read and a creative premise. As a classic and free on the Kindle, I'd recommend it.